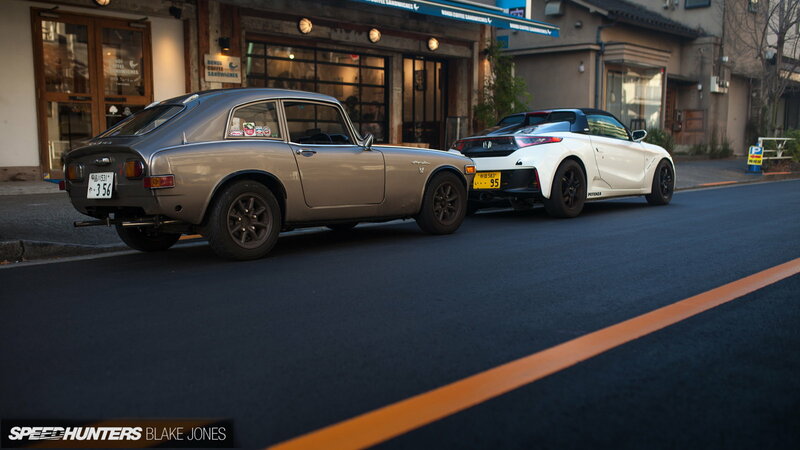 A trip to Spoon Sports' Type One headquarters to check out their Honda S660 modifications throws an S800 into the bargain. Anyone who reads this forum has read the words 'Spoon Sports' more times than they can remember, and Honda's introduction of the kei class S660 in 2015 gave Spoon an opportunity to further their reputation. Diminutive kei class cars account for one out of every three new cars sold in Japan, but what the S660's tiny size trades away in storage and interior room—there's a mini-trunk up front but it's meant for storing the convertible's detachable canvas top when not in use—it gains in maneuverability. At around $20,000, Honda's S660 is on the expensive end of the spectrum for a kei car, but at 850kg (1874 lbs) it's not only one of the lightest but also one of the least expensive mid-engined cars on the market. The low-slung S660's mid-mounted engine is a turbocharged inline three-cylinder and comes with either a CVT or 6-speed manual transmission. This package was made for tuning and Spoon wasted no time in developing a range of upgrades for engine, brakes, and suspension. 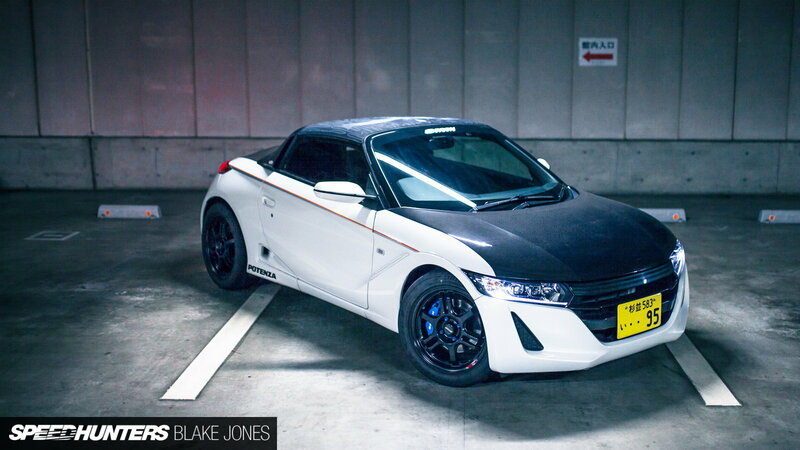 >>Join the conversation about this Spoon S660 right here in the S2ki Forum! In true Colin Chapman spirit, the S660 features some suspension components mounted directly to the monocoque chassis with minimal subframe involvement. Spoon soon realized there was way too much flex under braking, so they developed a series of stiffening braces to tie the whole front end, including the steering rack, together. Spoon's pieces use factory mounting points, allowing owners to upgrade without making permanent, destructive modifications to what are quite new cars. The result is as expected—better feel and more predictable handling in performance situations. Turning attention out back, the S660 utilizes a cast aluminum rear subframe and Spoon determined it was the same story as at the front—more bracing was needed. They developed slick pressed-steel support plates to add strength to the areas where the chassis and suspension come together. 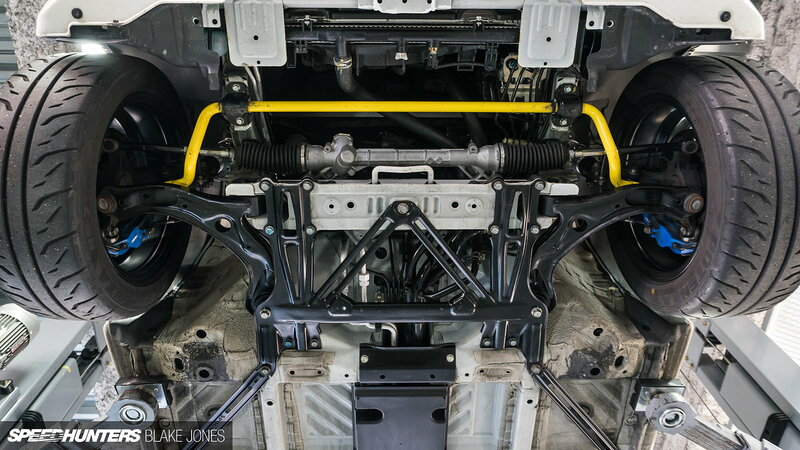 While they were at it, they designed an adjustable and more capable sway bar for production and prototyped a carbon fiber rear diffuser that adds both aerodynamic and cosmetic value. When the staff from Speedhunters made the trek to Spoon Sports' headquarters, known as "Type One," they took their pal Skorj along, on the condition that he'd bring his 1960s-era Honda S800 to the party. Hijinks ensued. They reported that, as expected, the turbocharged S660 walked away from the S800 from a standing start, but confessed to falling in love with the effortless charge up to the older Honda's 9,000 rpm redline. The S660, for its part, felt happiest around 6,000 rpm, though its redline is officially 7,700. Endless entertainment was supplied by the S660's blow-off valve, which is located just a few inches from the driver's head. Both cars have somewhat vague gearboxes according to the drivers, and almost as bothersome. They stalled the S660 due to it's motorcycle-esque light flywheel and low off-the-line torque. A nice feature of Honda's doing is a NACA duct built into the stock belly pan that sends air to cool the transaxle. Another appealing flow-oriented feature is the S660's center-exiting exhaust. With not much interior, Spoon hadn't much to do in that department, though they did relocate the infotainment system controls on their example to the glovebox for a cleaner look. One really nice touch is that the climate control system can be set to pour heat on your feet with the top off, cocooning you in warmth for cruising on cold nights. 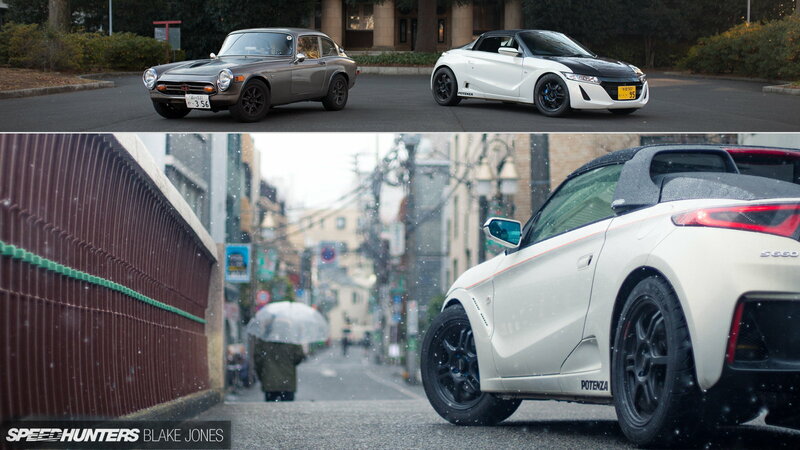 Together Spoon and Honda have you covered, from the ground up to as far as warm vibes can rise from the stellar S660.